Push–to–Pass Parameters: 150 seconds of total time with a maximum time of 15 seconds per activation. 2016 Verizon P1 Award Winner: Simon Pagenaud, 1 minute, 16.2565 seconds, 112.594 mph. NBCSN Telecasts: Practice 2, 5 pm ET Friday, Sept. 15 (live); Qualifying, 6:30pm ET Saturday, Sept. 16 (live); Race, 6:30pm ET Sunday, Sept. 17 (live). Leigh Diffey is the lead announcer for NBCSN alongside analysts Townsend Bell and Paul Tracy. Pit reporters are Jon Beekhuis, Katie Hargitt, Kevin Lee and Robin Miller. Advance Auto Parts INDYCAR Radio Network Broadcasts: Mark Jaynes is the chief announcer alongside analyst Davey Hamilton. Nick Yeoman (Turn 7) and Jake Query (Turn 9) are the turn announcers with Dave Furst, Rob Howden and Dan Rusanowsky reporting from the pits. All Verizon IndyCar Series races are broadcast live on network affiliates, Sirius 214, XM 209, IndyCar.com, indyCarRadio.com and the INDYCAR Mobile App. All Verizon IndyCar Series practice and qualifying sessions are available on IndyCar.com, IndyCarRadio.com and the INDYCAR Mobile App. INDYCAR Mobile App: Verizon’s INDYCAR Mobile App is available across all carriers. Exclusive features for Verizon Wireless customers will stream live through the app and include enhanced real-time leaderboard and car telemetry; live in-car camera video streaming for select drivers during Verizon IndyCar Series races; live driver and pit crew radio transmissions during races and live Advance Auto Parts INDYCAR Radio Network audio streaming during all track activities. • Josef Newgarden leads the Verizon IndyCar Series championship with one race to go for the 1st time in his career. Newgarden took the championship lead following his win at Mid-Ohio on July 30. • Josef Newgarden leads Scott Dixon by 3 points with Helio Castroneves (-22) and Simon Pagenaud (-34) just behind. With 104 maximum points available this weekend, the championship could likely be a winner-take-all situation for any of the top 4 drivers. • There are 7 drivers mathematically eligible for the 2017 Verizon IndyCar Series championship: Josef Newgarden, Scott Dixon, Helio Castroneves, Simon Pagenaud, Will Power, Alexander Rossi and Graham Rahal. Dixon has won 4 Verizon IndyCar Series championships (2003, ’08. ’13, ’15), while Power and Pagenaud have each won the Verizon IndyCar Series championship once. Power in 2014, while Pagenaud in 2016. Newgarden, Castroneves, Rossi and Rahal have never won the championship. • This is the 12th consecutive year that the Verizon IndyCar Series champion will be determined at the final race of the season. • This is the 14th Indy car race at Sonoma. The winning driver at Sonoma has won the championship three times in the prior 13 races (Dario Franchitti in 2009, Scott Dixon in 2015 and Simon Pagenaud in 2016). Key Championship Point Statistic: This is the 12th straight season that the Verizon IndyCar Series Championship will be decided in the final race. Point Differential: The 3 points that separate Josef Newgarden and Scott Dixon atop the standings is the closest margin with one race to go since 2007 when Dario Franchitti led Dixon by 3 points. The closest margin with one race to go was 2006 when Helio Castroneves led Sam Hornish Jr. by one point. The average deficit with one to go since 2006 is 19.6 points. The 22 points between Newgarden and third-place Helio Castroneves is the closest margin between 1st and 3rd since 2009 when just 8 points separated the top 3. Championship–eligible Drivers Results at Sonoma: Josef Newgarden has never finished in the top 5 at Sonoma. He recorded his best finish (6th) in 5 starts in 2014; Scott Dixon has 6 top-five finishes in 12 starts, including wins in 2007, 2014 and 2015; Helio Castroneves has 6 top-five finishes in 12 starts, including a win in 2008; Simon Pagenaud has 3 top-five finishes in 6 starts, including his win in 2016; Will Power has 4 podium finishes in 6 starts, including wins in 2010, 2011 and 2012. • There have been 10 different winners in the 16 previous Verizon IndyCar Series races in 2017: Sebastien Bourdais (Streets of St. Petersburg), James Hinchcliffe (Streets of Long Beach), Josef Newgarden (Barber Motorsports Park, Streets of Toronto, Mid-Ohio Sports Car Course and Gateway Motorsports Park), Simon Pagenaud (Phoenix Raceway), Will Power (INDYCAR Grand Prix, Texas Motor Speedway and Pocono Raceway), Takuma Sato (Indianapolis 500), Graham Rahal (Raceway at Belle Isle-1 and 2), Scott Dixon (Road America), Helio Castroneves (Iowa Speedway) and Alexander Rossi (Watkins Glen International). A new winner at Sonoma would equal the Indy car all-time record of 11 in a season, which has occurred 3 times, most recently in 2014. Bourdais’ win at St. Pete on March 12 gave him sole possession of 6th on the all-time Indy car victory list with 36 wins. Dixon’s win at Road America on June 25 was his 41st career victory and he will tie Michael Andretti for 3rd all time with his next win. Castroneves’ win at Iowa on July 9 ended a 54-race winless streak and gave him sole possession of 12th all- time with 30 wins. Power’s win at Pocono on Aug. 20 gave him sole possession of 9th on the all-time list with 32 wins. 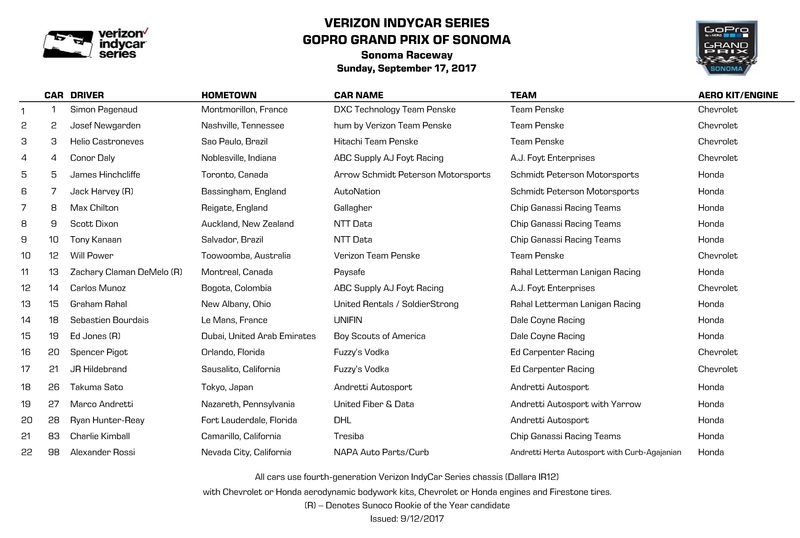 • The GoPro Grand Prix of Sonoma will be the 11th road/street course race of the 2017 Verizon IndyCar Series schedule with 7 drivers winning the previous 10 races: Sebastien Bourdais (Streets of St. Petersburg), James Hinchcliffe (Streets of Long Beach), Josef Newgarden (Barber Motorsports Park, Streets of Toronto, Mid-Ohio Sports Car Course), Will Power (INDYCAR Grand Prix), Graham Rahal (Raceway at Belle Isle-1 & 2), Scott Dixon (Road America) and Alexander Rossi (Watkins Glen International). • The GoPro Grand Prix of Sonoma will be the 14th Indy car race at Sonoma Raceway. Simon Pagenaud is the defending race winner. This will be the 6th race on the 12-turn, 2.385-mile layout. The Verizon IndyCar Series competed on a 12-turn, 2.303-mile layout from 2005-2011. • Will Power and Scott Dixon are the only drivers to win at Sonoma more than once. Dixon won the race in 2007, 2014 and 2015, Power won in 2010, 2011 and 2013. Past winners Dixon, Power, Tony Kanaan (2005), Marco Andretti (2006), Helio Castroneves (2008) and Simon Pagenaud (2016) are entered in this year’s race. • Will Power has won 5 of the last 7 pole positions at Sonoma (2010-12 and 2014-15). Other past pole winners entered this weekend are Scott Dixon (2006), Helio Castroneves (2008) and Simon Pagenaud (2016). Four drivers have won the race from the pole: Castroneves (2008), Dario Franchitti (2009), Power (2010-11) and Pagenaud (2016). • Three drivers have competed in every race at Sonoma since Indy cars returned to the track in 2005: Helio Castroneves, Scott Dixon and Tony Kanaan. Dixon is the only driver to complete every lap in those 12 races. • Team Penske has won at Sonoma six times, including five of the last seven races with Will Power (2010-11 and 2013), Ryan Briscoe (2012) and Simon Pagenaud (2016). Chip Ganassi Racing has won four times at Sonoma (Scott Dixon in 2007, 2014-15 and Dario Franchitti in 2009) and Andretti Autosport has won twice (Tony Kanaan in 2005 and Marco Andretti in 2006). • At least three rookies – Jack Harvey, Ed Jones and Zachary Claman DeMelo – are entered. Jones has already clinched Sunoco Rookie of the Year honors for 2017. Claman DeMelo is attempting to make his Verizon IndyCar Series debut. • Tony Kanaan seeks to start his 282nd consecutive race this weekend, which would extend his Indy car record streak that began in June 2001 at Portland. Teammate Scott Dixon has made 223 consecutive starts heading into the weekend, which is the second-longest streak in Indy car racing. Andretti Autosport’s Marco Andretti has made 199 consecutive starts, which is the fourth-longest streak in Indy car racing and the most of any driver to start their Indy car career. • Helio Castroneves will attempt to make his 344th career Indy car start, which ranks third on the all-time list. Tony Kanaan is fourth all-time with 342 starts heading into the weekend. INDIANAPOLIS (Sept. 13, 2017) – Starting in 2018, Zach Veach will take the wheel of the No. 26 Honda Indy car as the fourth entry in Andretti Autosport’s Verizon IndyCar Series effort. Veach has raced in every step of the Mazda Road to Indy ladder with Andretti Autosport, including a career-best Indy Lights championship finish of third in 2014. The 22-year-old American driver made his Verizon IndyCar Series debut April 23, 2017, at Barber Motorsport Park and his Indy 500 debut at this year’s 101st Running. Veach is the fourth driver confirmed to an All-American Verizon IndyCar Series field for Andretti as he joins Ryan Hunter-Reay (No. 28 DHL Honda), Alexander Rossi (No. 98 NAPA AUTO PARTS Honda) and Marco Andretti (No. 27 Honda). The 2018 season goes green on the Streets of St. Petersburg, Florida, March 11.